(The Philippine Star / Lawrence Agcaoili) MANILA, Philippines - Budget airline Cebu Air Inc. (Cebu Pacific) of taipan John Gokongwei now has a fleet of 48 aircraft as it enters the middle of a $4-billion massive refleeting program. Cebu Pacific took delivery of a brand-new Sharklets-equipped Airbus A320 last Dec. 22, bringing to 28 the number of its A320 aircraft. The aircraft carried 4.1 tons of medical equipment together with a doctor, two nurses and a coordinator in the Visayas region battered by Super Typhoon Yolanda last Nov. 8. The humanitarian mission flight was organized by Cebu Pacific and the Airbus Foundation in association with German charity, Humedica, with medical supplies being flown from Hamburg, Germany. 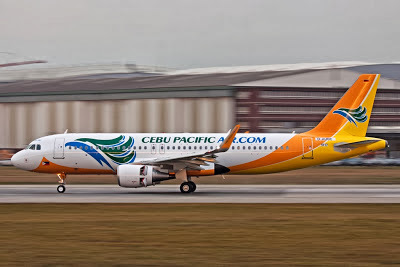 With this delivery, Cebu Pacific now operates a fleet of 48 aircraft comprised of 10 Airbus A319, 28 Airbus A320, two Airbus A330 and eight ATR-72 500 aircraft. The low-cost carrier is in the middle of a $4-billion refleeting program involving the acquisition of 49 brand new Airbus aircraft. Between 2013 and 2021, Cebu Pacific is scheduled to take delivery of 15 more brand-new Airbus A320, 30 A321neo and four A330 aircraft. Cebu Pacific is gearing up for possible flights to the US and Europe as the Civil Aviation Authority of the Philippines (CAAP) continued to address aviation safety concerns. Cebu Pacific president and chief executive officer Lance Gokongwei said the airline is gearing up for flights to Europe and the US as it launched its first long-haul flight to Dubai last Oct. 7. However, the airline’s plan to seek the green light from the European Union to fly to European air space in November got derailed after Yolanda battered several provinces in the Visayas. The EU, which lifted the ban on flag carrier Philippine Airlines (PAL) last July allowing it to fly to London last Nov. 4, is set to tackle Cebu Pacific’s application in March. The US Federal Aviation Administration is expected to make an announcement on the upgrade of the country’s status back to Category 1 sometime in January. It would be recalled that ICAO lifted the remaining significant security concerns after Philippines, through the CAAP, passed the audit conducted in February, paving the way for the series of upgrades. Cebu Pacific operates an extensive network serving 33 domestic routes and 24 international destinations through six hubs including the Ninoy Aquino International Airport, Mactan Cebu International Airport, Diosdado Macapagal International Airport in Pampanga, Davao International Airport, Iloilo International Airport, and Kalibo International Airport.